The output of ideas and collaborative strengths during our May 2016 Conference included a segment of producing Artifacts. The challenge? Create something “related to young children’s oral language and literacy learning in play or Creative Collaborative Curriculum Activity contexts, particularly in northern rural and Indigenous communities”. The branches of the tree represent the different applications and the goals of play- based approaches, and the roots represent the foundation (which includes theoretical knowledge) of such approaches. Our own Jayson SanMiguel, Amanda McLean, and a contingent of NOW Play Teachers developed this unique Tree and captured the essence of the Project and the aims of Teachers to foster this enriching environment. Play connects us to home. Play has the potential to embrace our multiple identities. Join collaborators Eefje van der Zalm from Utrecht (who was truly “three thousand miles away from home”), Burcu Ntelioglou from the University of Manitoba, NOW Play’s Soon Young Jang, and a small group of NOW Play teachers as they drum and sing. The video captures the collective poem they created using meaningful totems and quotes to express what the educators learned from the Conference. For educators interested in learning more about play-based learning, our own Alesia Malec and Jennifer Briere join Associate Professor Gisela Wajskop— an expert in play-based learning from São Paulo— and an assortment of NOW Play teachers and Ministry of Education’s Greg Farrell in devising this helpful presentation as to how to implement play-based inquiry in the classroom. Join Maureen Kendrick from the University of British Columbia, Janice Greenberg, Deborah Burnside, and a group of talented, red-socked NOW Play teachers as they perform a traditional dance to a traditional tune. Narrated by NOW Play’s Wendy Byrnes. Come learn why “Métis dance… is a form of social interaction in mastering learning and confidence with a sense of pride”. Collaborator Jim Anderson from the University of British Columbia, Shelley Stagg Peterson, Shakina Rajendram, and NOW Play Teachers created a set of tips for parents who want to support their children’s oral language. We are very excited to announce the 2017 publication of an entire collection of artifacts in the NOW Play Book of Creative Collaborative Curriculum Activities. 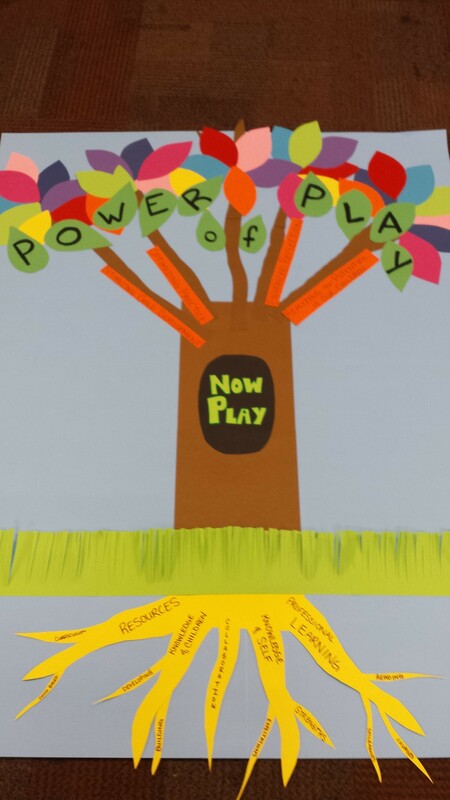 The activities in this collection were produced by teachers and partners in the NOW Play Project to promote playful learning for kids in pre-kindergarten to grade 2. Check out the dozens of ideas to bring into your classroom or learning centre today! In conjunction with Angela Ward, professor from University of Saskatchewan, Lori Huston, Marianne McTavish, NOW Play’s Christine Portier and a group of NOW Play teachers developed a NOW Play Spider Diagram, illustrating the various aspects of our 2016 May Conference that brought together knowledge bases and collaborative perspectives. Supplied in 2 formats. Ann Anderson, a Speech-Language Program Coordinator in Canada; Laureen McIntyre, a Speech-Language Pathologist and Associate Professor at the University of Saskatchewan; Resi Damhuis, a professor at Marnix teacher training college in Utrecht; Nazila Eisazadeh, a registered Early Childhood Educator and Ph.D Graduate at the Ontario Institute for Studies in Education; and some of the NOW Play participating NOW Play teachers developed an advice column for parents, educators, administrators and helping professors that touches on a variety of topics in Education, including assisting young people’s language and speech difficulties from the perspective of a teacher or parent. See the document for problems that might arise in or out of the classroom, and the expert advice plus further resources to assist you! “Imagine a grandfather coming into his grandchild’s classroom to sho w everyone how fish are filleted and to give them a chance to do it themselves”. This survey—assisted by Heba Elsherief, First Nations speech pathologist Sharla Peltier, renowned expert in Play from the University of Auckland, Helen Hedges, and a group of NOW Play teachers—leads the parent and teacher through the various “lenses” which engage children, as well as make meaningful connections to their community and family. Contributors Eefje van der Zalm and Resi Damhuis share their engaging secret for drawing out the critical and creative processes in a child by building upon what they discover when faced with a problem. This hands-off, yet guiding principle: Uitdagen tot gesprek (“Challenge to talk”), provokes and stimulates meaningful exchanges that empower the child while enhancing their contextual knowledge in a real-life, real-time experience.